After enjoying the first Bloggers United event in February (and still working my way through the boatloads of product received at said event) I was thrilled to be invited to help celebrate their first anniversary with LUSH down at Marion this weekend. I had been given a few LUSH products as gifts many years ago but wasn't very familiar with their range. Ironically, this is largely to do with their popularity, as the city store is always jam-packed so I never go in for a look. It was great to have the opportunity to have a thorough poke around the store at leisure and learn more about their products, processes and philosophies. Everything is so natural, it's practically edible. For reals, I thought this was a dessert bar. There was a fun scavenger hunt. Nici and I tried valiantly but were not the winners. You try reading through hundreds of ingredient listings for specific food items! 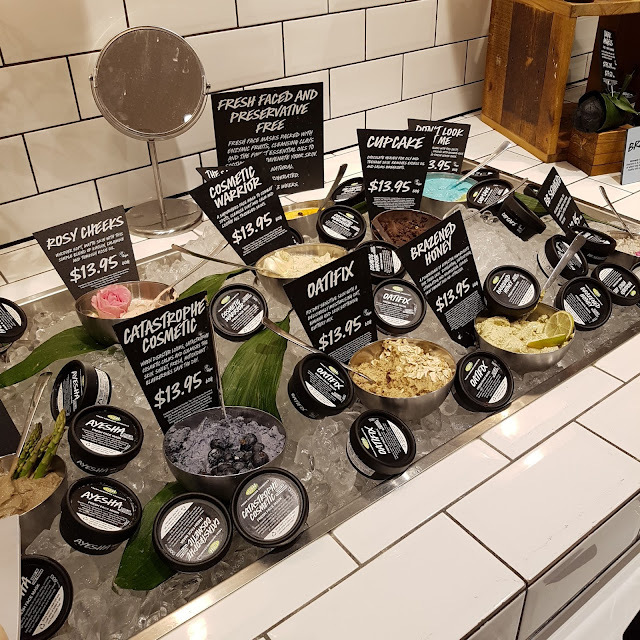 The staff were super friendly, charming and passionate about LUSH, with good knowledge of the products they sell; not only uses/suitability but ingredients and ethicality. Is that even a word? Is now. I have already used it, and it feels fantastic! Great way to wake up the face. 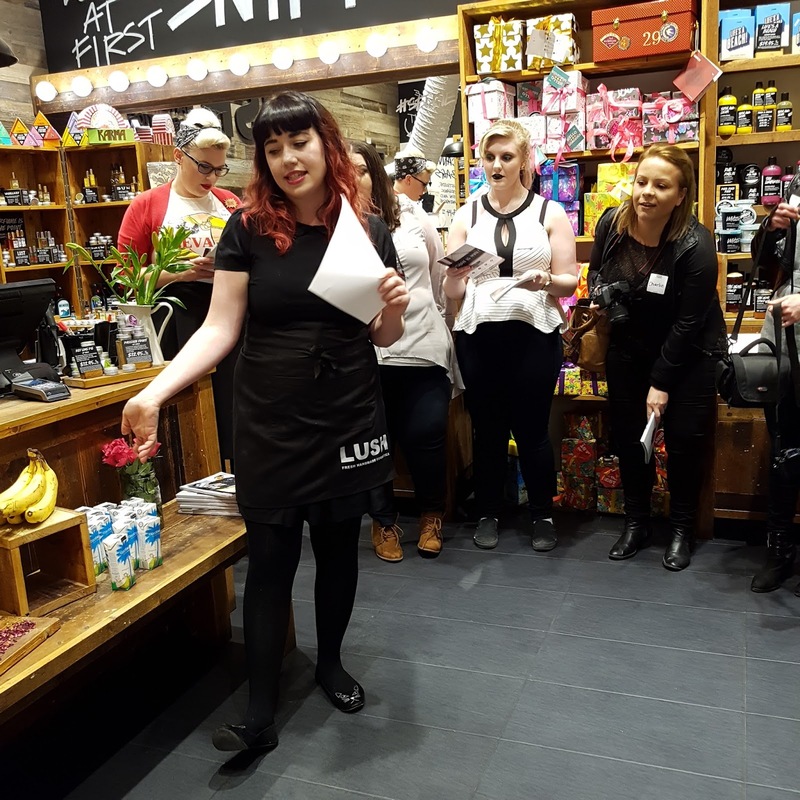 Thank you to the Bloggers United team, especially Kate from Seduced by Beauty and Nici from Beauty & Food for their work in organising the event. Edit: BTW, my Disqus comment system disappeared so apologies if you left a comment using the Blogger system and it got eaten. Not snobbing you! 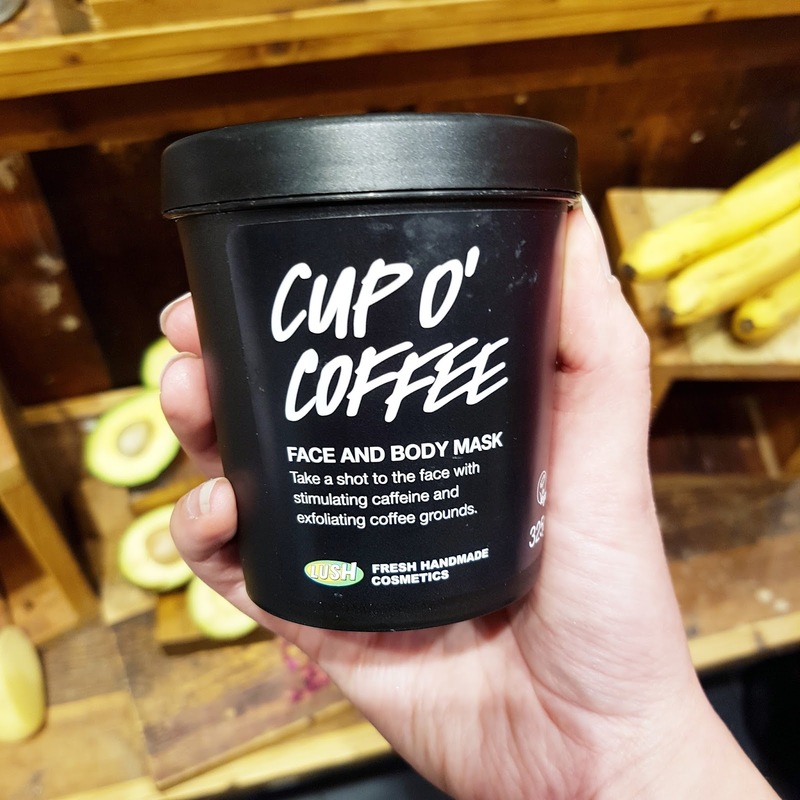 I only just started blogging (7 posts in) and have stumbled across a few posts from bloggers that attended the lush event. I haven't been into a lush store since my senior year of high school! 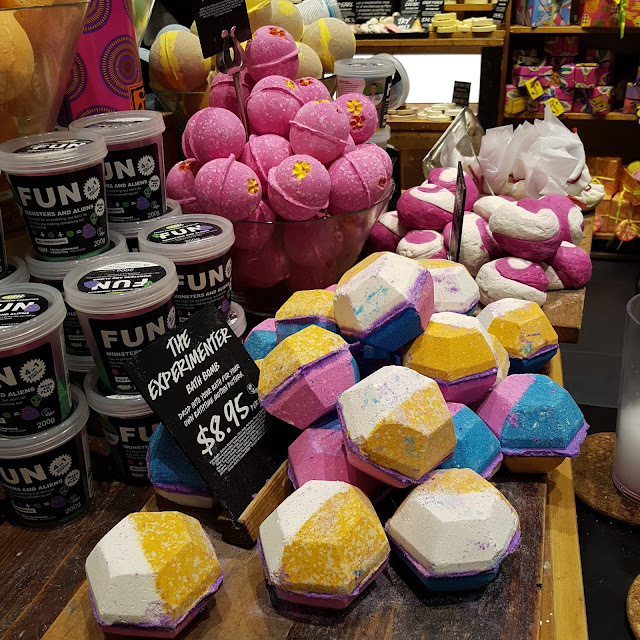 So, today I went and splurged on some goodies - LOVE LUSH and was so surprised at how much their range has grown since my last visit! Awesome Breharne! Good luck with your blogging too! 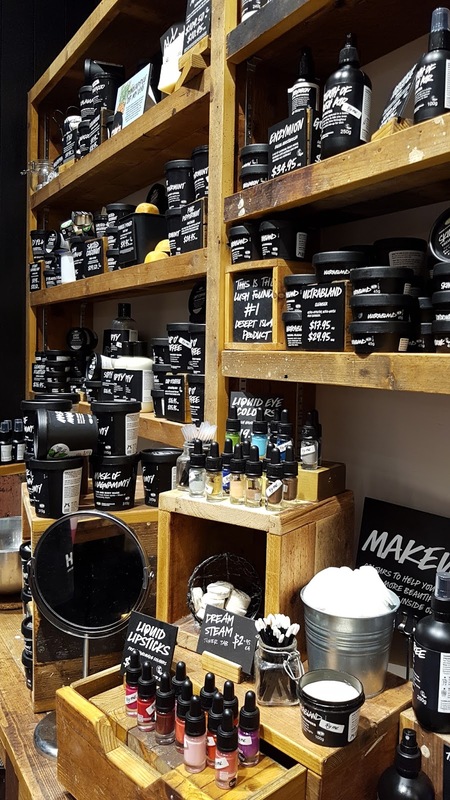 I have always thought a Lush shop was like a food store. Unfortunately for me the overwhelm of the scents prevent me from going into a store these days but they sure are pretty! It's definitely heavily fragranced stuff Denise. The Marion store had its own extractor fan! I'm well jel - I LOVE Lush. I just got the Bubblegum lip scrub and it's a game changer for winter lips! I strongly considered the Popcorn lip scrub Sammie! Im not gonna lie, I thought it was a dessert bar too! I love my face moisturiser, its ah maz ing!! Kind of disappointed it wasn't too? Hahaha. Good to hear the moisturiser is awesome! I know, Kat - talk about spoiled for choice! Looks like a blast! How do you get invited to these bloggers united things? Is it just a beauty blogger thing? No - Bloggers United is for everyone but it does have a strong beauty focus. I think they might have a mailing list, otherwise follow them on Insta or the state reps, Kate and Nici, who also run Promote SA, which has a mailing list and worth getting onto as well!